Time to go buy some pints for the England game, be back folks! Aurier is a significant upgrade from Sagna. Sign him up! 3 goals, multiple subs, 2 guys "hurt" and that equals 4 minutes? I hope Webb at least added time for forgetting how to restart the game? Tom I almost had a heart attack. Very very good game. Hats off to IC!! ygomez, you're right! A superb game, that. 2 extra points stolen by the Colombians there. But it was a great game. And that celebration Deserved the 3 points! 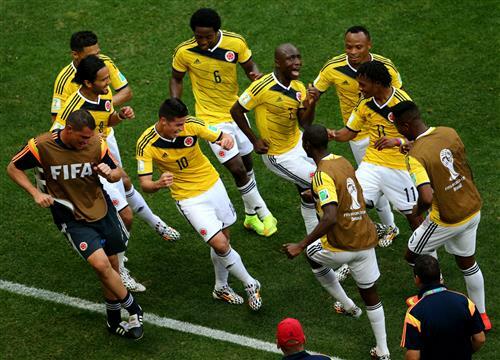 Great team celebration by Colombia! That goal for Ivory coast could prove pretty useful. Goal differential a realistic possibility in this group. No Didier Zokora for Ivory Coast next Tuesday v. Greece. Could be a problem? Ivory coast win anything with this yaya drogba generation? 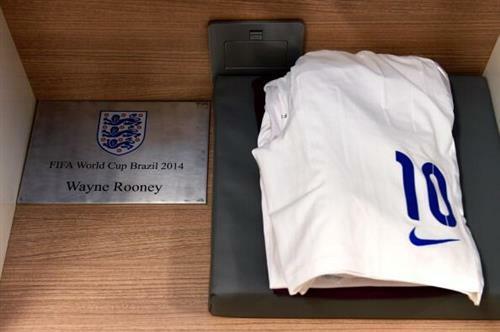 England's starting 11 says as much about Uruguay's weaknesses as it does about England. I like Lallana and Barkley but you have to run Uruguay until they are exhausted before bringing in the fresh, young legs. Webb got run into the ground on that one. Not his best showing. Eskimo, I felt he was played well by the Colombians as the game wore on - strange for a referee so used to taking no silly business in the Premier League. Concacaf and Conmebol have been great this tournament. Maybe the WC trophy will come back to America. Tom, you've watched enough of England...Do you not think Lallana should be starting? He keeps the ball better than anyone on the pitch for them which is extremely important especially in the heat of Brazil. COYS, I think he should be, but it's difficult to see who to drop. I'd have Welbeck for his defensive work from the start, then Lallana to open things up around 60 mins in. Thanks Tom.......see ya guys tomorrow.......time to head home to Vegas !!! Hello everyone! I'm fresh from a terrifying spell covering Colombia against the Ivory Coast with a deadline so tight that my computer squeaked when I pressed 'send'. Time to sit back and relax by....Oh no. It's England, isn't it? My heart can't take a day like this. After that wonderful match, we get England v Uruguay!? Best month every four years! So: Chile and Colombia through. Brazil almost certainly through. Ecuador can still get out if they can steal a win from France. Ivory coast had that one, shame they couldnt covert all that pressure at the end. Hope they beat greece next week! What's the odd of England booking the plane home today? Late night in India...eyes says sleep and heart disagrees! Of course it is still an open group. Columbia just in a good position but not out of the woods yet. Wow, Iain MacIntosh making a Boot Room appearance! Try to avoid any party fouls. A big welcome to Iain, people! Any chance Baines gets skinned again today? hello mr. iain.... what are your prediciton then?